I bought a Shaping Machine. It's by Reeds n Stuff, and I purchased it from Innoledy, taking advantage of Tong Cui's helpful customer service. It's making me extremely happy, because the hand-shaping process has always been a big pain point for me. That's an exaggeration, I suppose. But I'm fed up with having to spend time on tasks that don't require sensitivity or skill. When I shape by hand, I take my soaked, gouged cane, fold it in half, cut two corners off so the cane will fit between the ears of the shaper tip, then put it onto the shaper. I crank the arms down to hold the cane snugly in place, then I use a razor blade to peel away all of the cane that lies outside of the shaper form itself. This requires four to six strokes on each side of the shaper, and I resharpen the razor blade after every two or three pieces of cane. In all, the process averages slightly under two minutes per piece. In this technique, I am left with two "ears" at the top of the shape, which I cut off after winding, an extra second or two per reed. On my new Shaping Machine this time is cut dramatically. I lay my gouged cane directly on the flat form, and lock it down with one easy motion from the handle. I use the two double-sided blades to cut both sides off of the cane simultaneously - a total of four short swipes for a perfectly shaped piece. I then lift the handle to release the cane, fold it in half at the score-mark, and I'm ready to wind. There are no ears at the top, so when I cut the thread at the end of winding I am done with the blank. This shaping process takes an average of 20-30 seconds per piece. 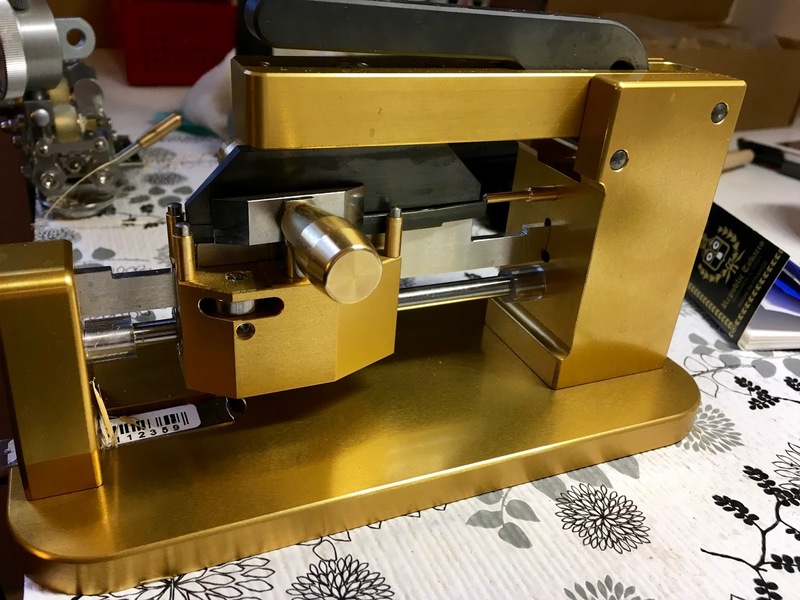 The machine is very handsome -it's a shiny golden bronze color, and glows with efficiency. It locks down on my desk with a nice hand clamp. It's also easy to change the shaper form, requiring only a small flat screwdriver, which I always have on my desk anyway for oboe emergencies. I was surprised, though, at how hard it was to find the right shape for me. There is a long list of shaper forms that go with this machine, but the names I recognized and tried bore NO resemblance to the versions I'm used to. I tried an RDG -1, and a -1N, and both were CRAZY wide and flared for my taste. I think of those two shapes as quite narrow, but somehow in the translation to flat forms they lost their usefulness to me. I also tried a shape called Coleman - it worked much better, in that the sides were much more parallel so I was able to manage the pitch and the core of the sound predictably. But it was quite a bit wider than the shapes I prefer. Although it didn't flare much, it was thicker through the throat and belly, and I found that I struggled to focus the sound, and especially that my students had a hard time playing the reeds up to pitch. It reminds me of the Ruth shape, which is currently in my stable of tips, and which I use when I want something SERIOUSLY beefy to project over a big group, or when I'm making reeds for high altitude. The shape I wound up with is called Liang, presumably after Liang Wang, the outstanding principal oboist of the New York Philharmonic. It's very similar to my narrowest shapes - the RDG -1N and the Samson+1, both of which I use regularly. I will probably do more experimenting in the future, but for now I'm very happy with the way the Liang shape is working for me, and especially with the time savings I'm seeing from the new machine. I still have all my old shaper tips. I'll still customize anything for anyone. But this new shape is on its way to becoming my standard reed, the basic version that you can expect when you order from me. Let me know how you like the reeds! Good luck with your new "toy" Just curious, how much time you save getting to the final product. And is there any perceptible difference in the sound production? Hi, Dimitri! I'd say that the task that used to take me 20 minutes a night is down to 5. That feels GREAT! I think the machine - vs hand-shaping - has no effect on the final product, but every shape has slightly different characteristics. Hence the long discussion of my shaper choices - but the one I've settled on feels familiar and comfortable already. I'm curious how often you have to change (or sharpen) the cutting blade(s) on your new machine? I'm curious too! So far - a few weeks in - not at all. But the process will be easy - they lift right off the machine and are beveled blades that should sharpen quickly on my regular stone. That's my guess, anyway.